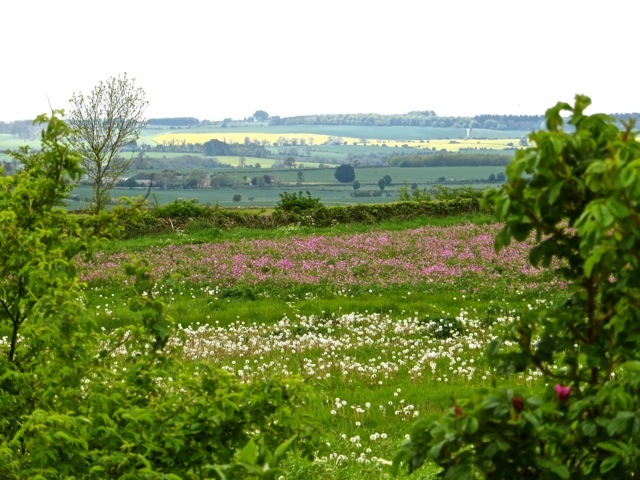 Sally and I planned a two-week drive through England in May to catch the flowering season. We planned to land in London, drive west to Stonehenge, then north to Lake District, east along Hadrian’s Wall, and back to London along the east coast. But this driving tour gave us more problems than we wished for. When I went to the car rental agency in Heathrow Airport, I was dismayed that I left my driver’s license in Tammy’s apartment in New York. A frantic call to Tammy arranged an express delivery of the license to London. It took two days and costed $62, an expensive mistake that threw our itinerary off by two days. 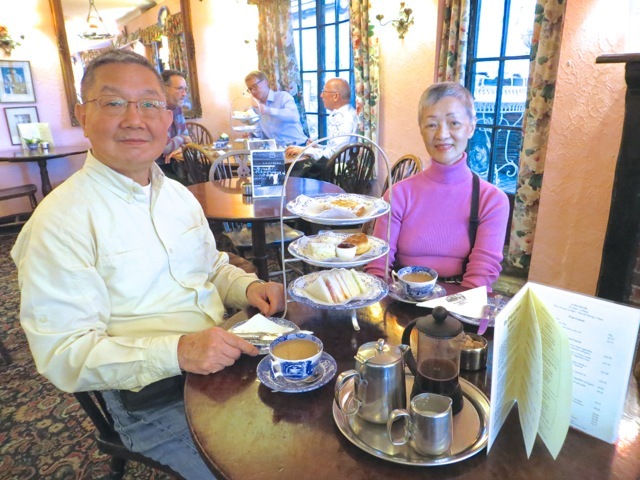 While we were held up in London, we visited Kew Gardens and had a very nice high tea in an old inn. After I picked up the car on the third day, I drove it for three days before I filled it with diesel fuel. 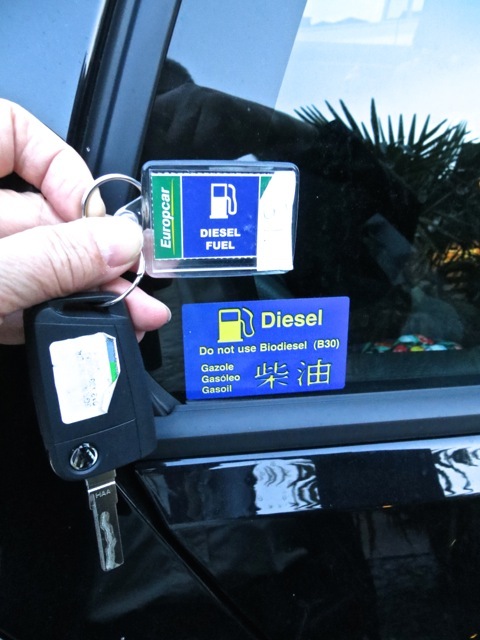 The sticker on the car window said diesel, the key fob said diesel, and I believed them that the car was a diesel. But the car in reality was a gasoline powered car. It sputtered and we barely made it to the hotel before it died. 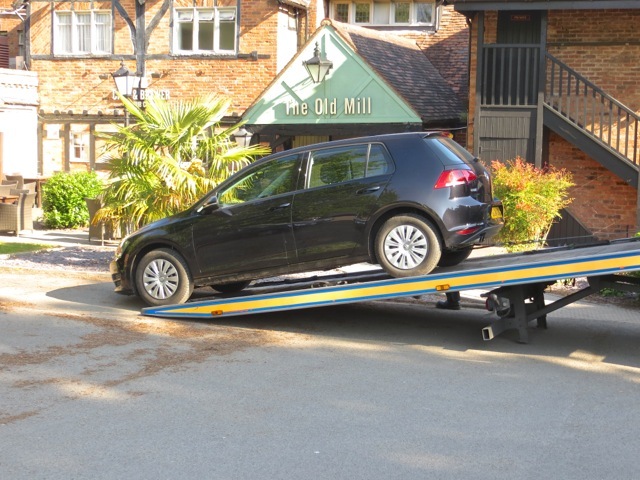 A flatbed tow truck carried the car and us to a car rental agency office where we got a replacement car. 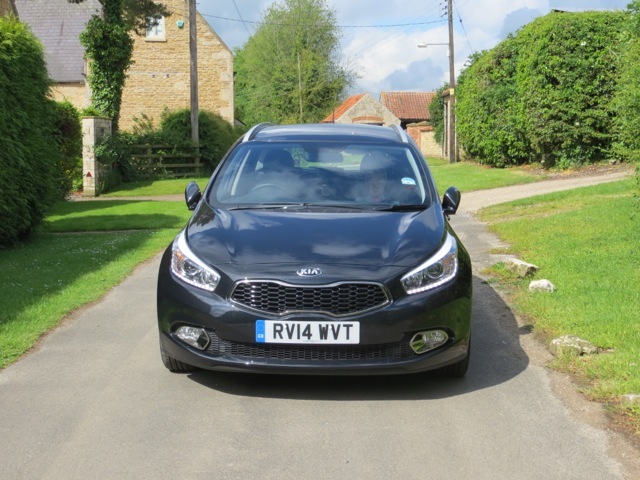 This replacement car was indeed a diesel and drove sluggishly. Furthermore, its front wheel alignment had too much toe-out and the car drifted on the road, making the driving experience unpleasant and tiring. With these mishaps at the beginning of our driving trip, we were in no mood for additional problems. I used the Google Maps GPS in my iPhone for driving directions. It worked very well and gave clear directions. But occasionally it could not be initiated and refused to accept a new destination. 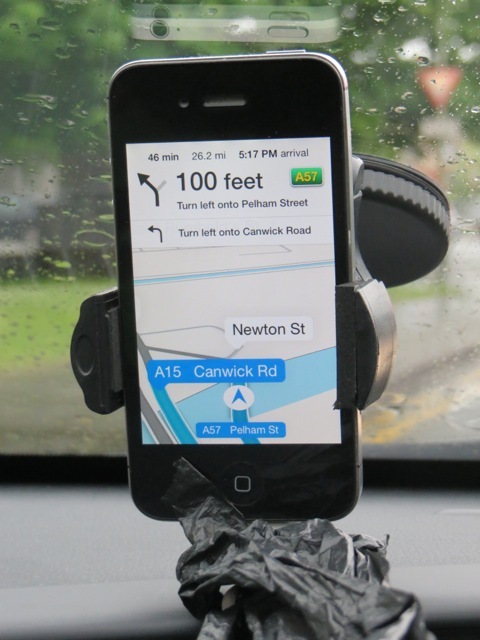 I then had to resort to Apple Map GPS as a backup. I found the Apple app to be less user friendly than Google. Occasionally, its route map was obscured by street names. Using the GPS, I set the destination and trusted the machine’s commands. The seemingly all-knowing machine gave me complicated directions that led us through narrow alleys and twisty country lanes. I drove through countless round-abouts (traffic circles) and exited at the first or third exit as directed by the GPS. After a few round-abouts, I lost all sense of direction and put myself completely at the mercy of the GPS. To my amazement, the GPS always led us to our destinations. Occasionally, an on coming car in a single lane required one of us to back up. 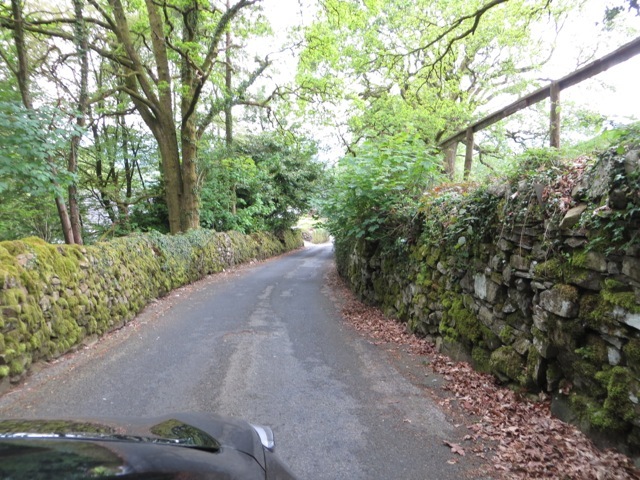 Many country roads in England are twisty narrow two-lane roads with no shoulders. 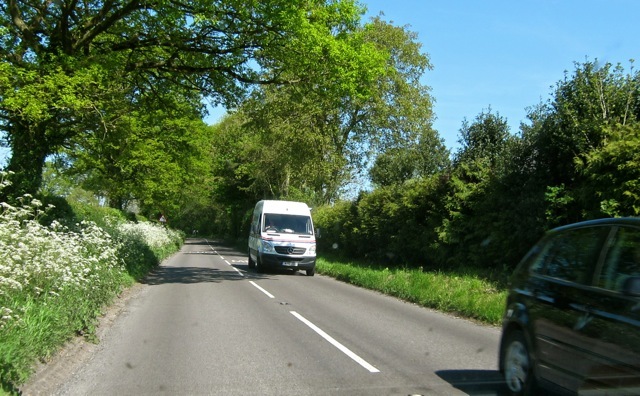 English drivers drive fast, 50 miles per hour (80 kph), past each other with inches to spare between cars. I learned not to look at on-coming cars, focused on my own car’s position in my lane and hoped for the best. 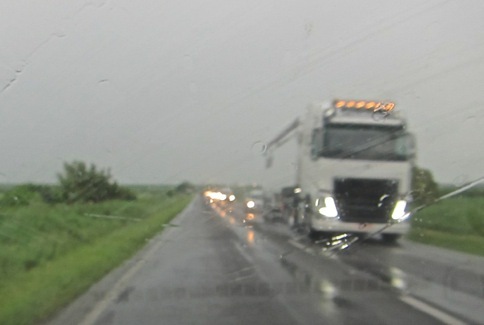 The worst experience I had driving in England was during a heavy rain. The country road was two-laned and carried heavy trucks speeding at 50 mph. With poor visibility, wet surface, and fast head-on traffic, I was apprehensive and was glad to reach our destination without mishap. On-coming cars seemed very close to my car. I retracted the side mirrors to avoid their being hit. Driving in towns was not much better. 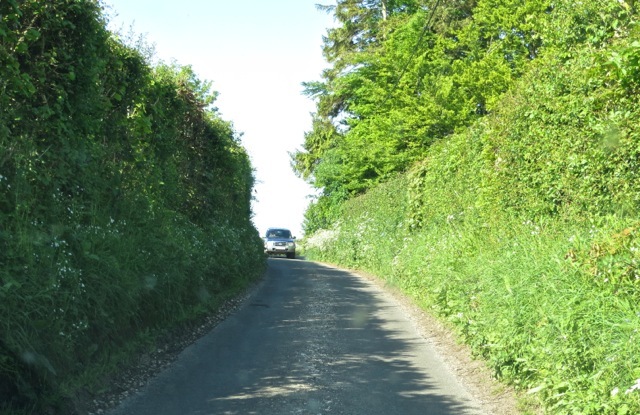 Many roads in English towns are narrow and twisty. 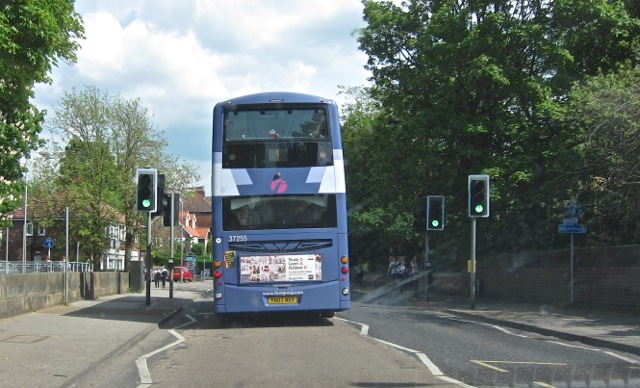 Big double decker buses occupied fully their lanes and left little room for other cars. 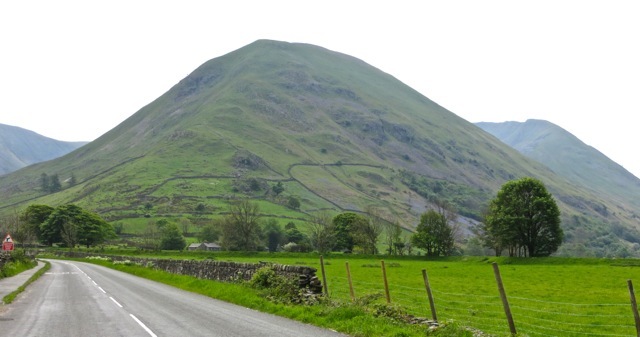 Forgetfulness, fueling mistake and driving difficulties notwithstanding, our drive through England offered us many beautiful sights. We were pleasantly surprised by the lush green landscapes. 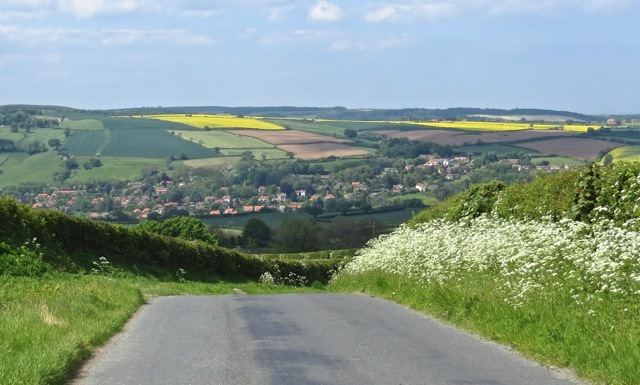 Everywhere we looked, there were verdant fields, wooded patches, bright yellow rapeseed flowers, and quiet villages. We saw very few advertisement or commercial signage, and not a single discarded plastic bag on the country roads. England is truly a wonderfully clean and lovely country. 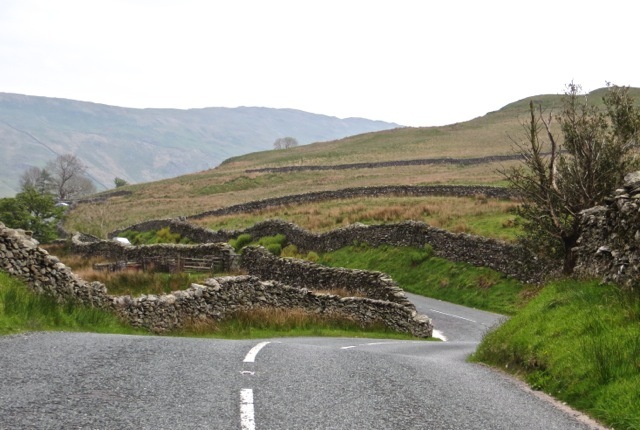 In the Lake District, roads are lined by stone walls. Land holdings are proclaimed by countless stone walls. The walls climb up steep hillsides to keep sheep from getting lost. It is a land of a thousand walls. The land under the thin veneer of soil is full of stones. They offer ready material to build stone walls. On one steep hillside, lovely pale blue flowers cover the ground. 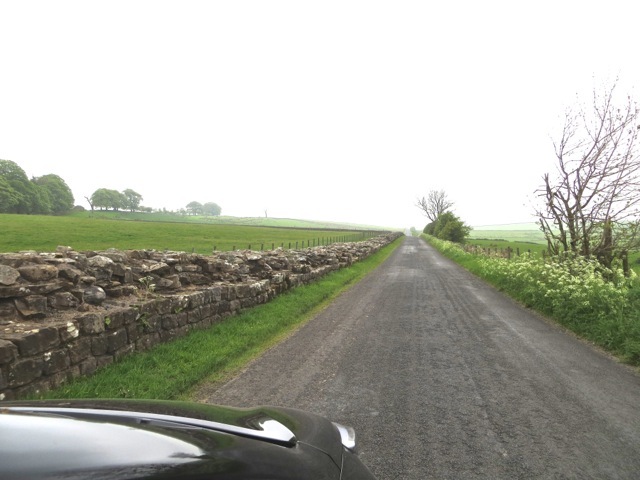 We drove along Hadrian’s Wall for awhile. 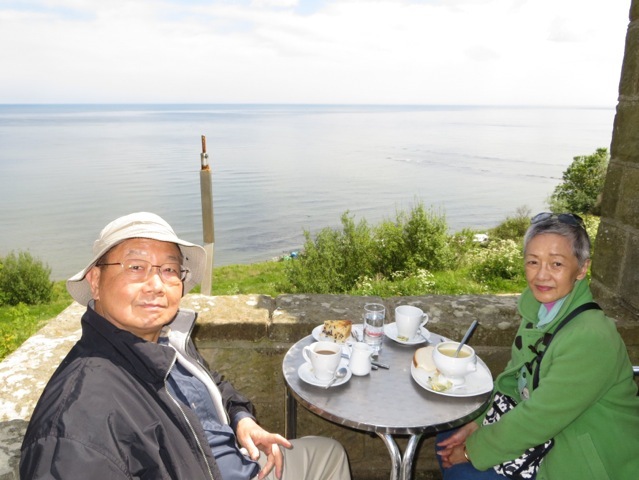 In one seaside village named, improbably, Robin Hood’s Bay, Sally and I found a little cafe over the sea to have a nice lunch. My Yorkshire curd tart had unusual texture and was delicious. I found they actually curd milk with lemon juice to make the pie filling. 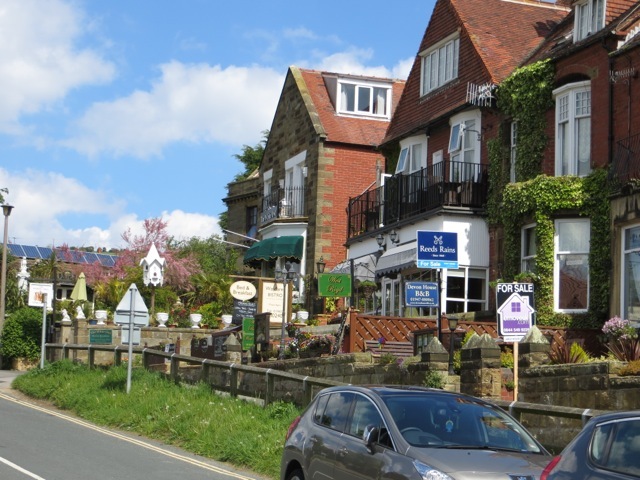 Every one of these seaside houses has turned into a B&B. The road going down to the beach is very steep. The walk to the sea was less strenuous than we feared and was surprisingly rewarding. 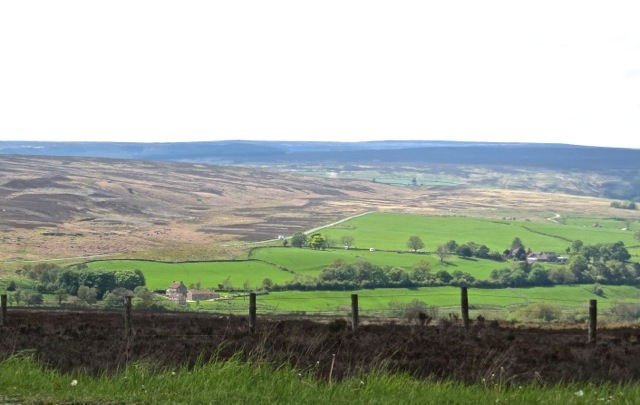 When we drove through North York Moors National Park, the landscape was startling. Sandstone underground produced peat swamp where only uninviting brown vegetation grows. 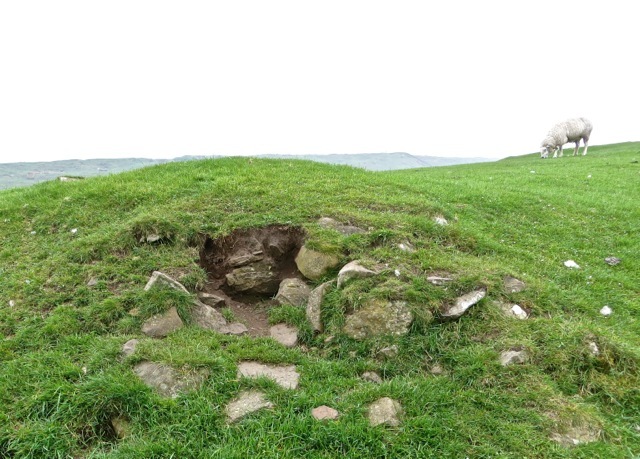 Nearby, limestone underground produced lush green productive pastureland. This scene is our favorite landscape. 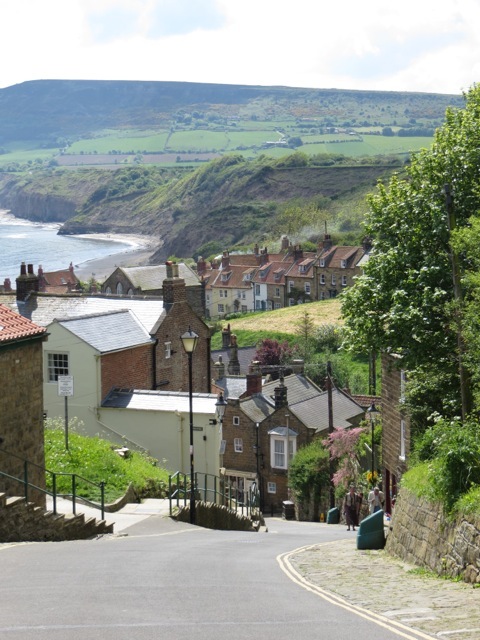 A pretty village nestles in a valley below green and yellow fields. 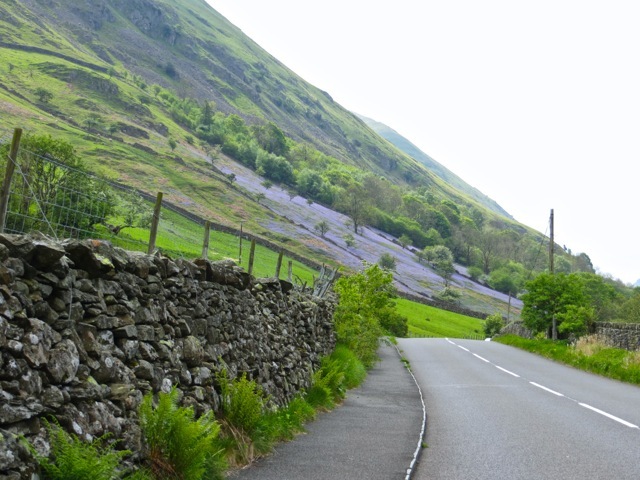 The road leading to this eden is lined by flowering hedgerows. Truly idyllic and memorable. Posted by Robert Wu on Monday, May 26, 2014, at 2:24 pm. Filed under Uncategorized. Follow any responses to this post with its comments RSS feed. You can post a comment or trackback from your blog.